Vacation rental house. 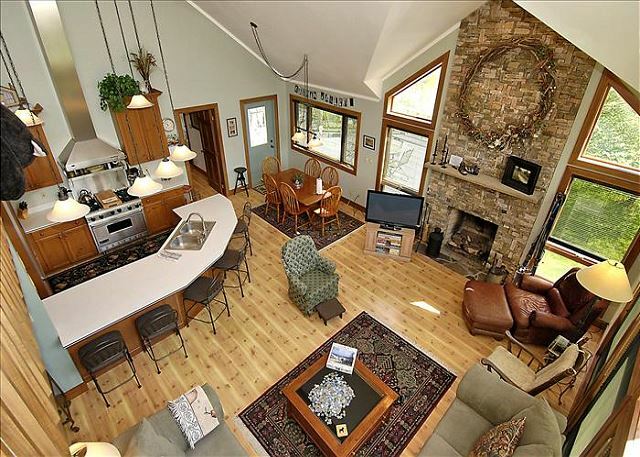 Sleeps 10, 3 bedrooms, 4 bathrooms. Dogs allowed. Higher Ground at Casa Bella - Spacious contemporary home offers a beautiful setting and endless amenities. Nestled beside a stream, the house features a lovely yard and amazing landscaping. 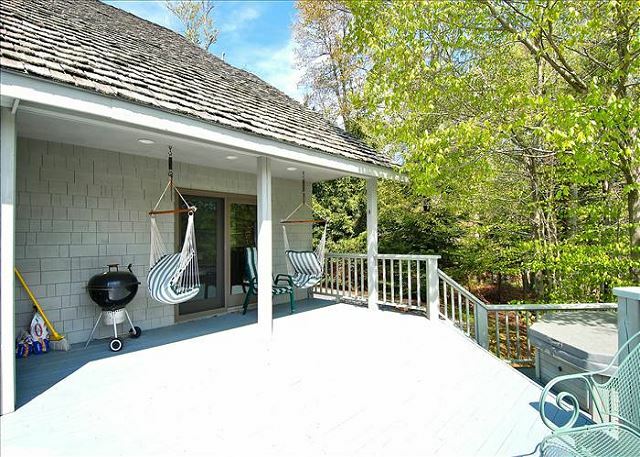 The large deck with hot tub and grill provides splendid views of the Timberline Conservancy and Cabin Mountain, and is the perfect place for entertaining or just relaxing. The open floor plan makes socializing easy for friends and family. Enjoy the gourmet kitchen, stacked stone fireplace, cathedral ceilings and recently added 42 inch HD plasma TV in the great room. The den just off of the living room provides the perfect space for reading, movie watching or game playing away from the crowd. 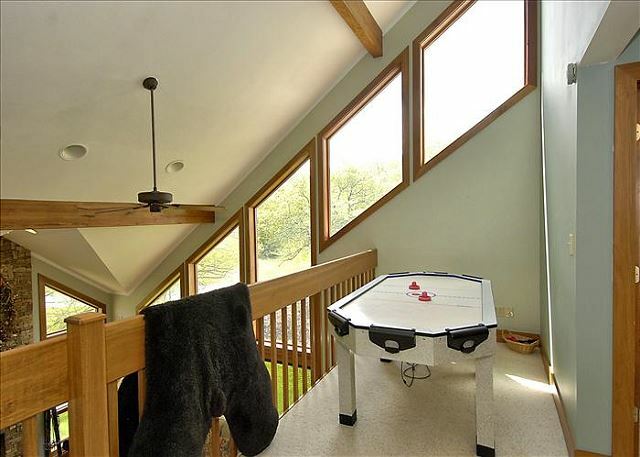 Kids of all ages will enjoy air hockey or foosball in the loft. 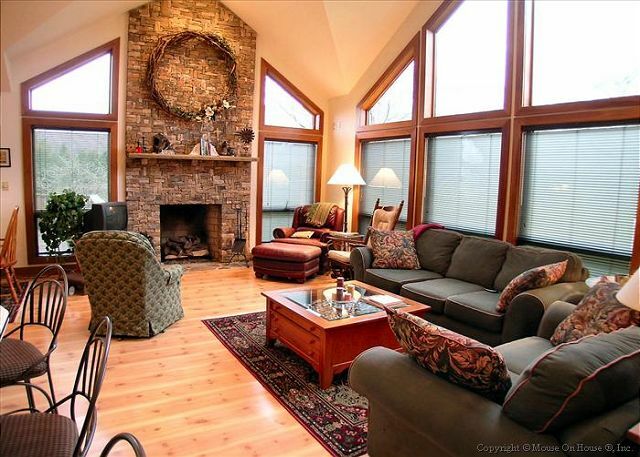 Whatever the season the large picture windows will bring nature to you complete with mountain scenery and wildlife. Work or just browse...free WIFI is available. A perfect spot for all things recreational, the house is close to hiking, horseback riding, mountain biking, downhill and cross country skiing. Booked this vacation based on looks of the cabin, which presents very well. and the surrounding area which offers endless opportunities for exploring, hiking,biking as well as restaurants and little shops. I was totally unaware of West Virginia and it's beauty. Clean and comfortable. Nothing to complain about. This house was great! Very "lodge" feeling. Lots of stuff for the kids to do. Very near Timberline and we hiked and walked everyday. Comfortably sleeps 6 adults and a few kids! Will definitely return. We would definitely rent here again! The house was the perfect size for our group of 8. The property was clean and comfortable. We loved having the little stream out back, the deck and the hot tub. The kitchen was well stocked and it was great to cook on a Viking stove. The only small downside to this property is it's close proximity to the access gate for Timberline Resort and that it doesn't have AC. 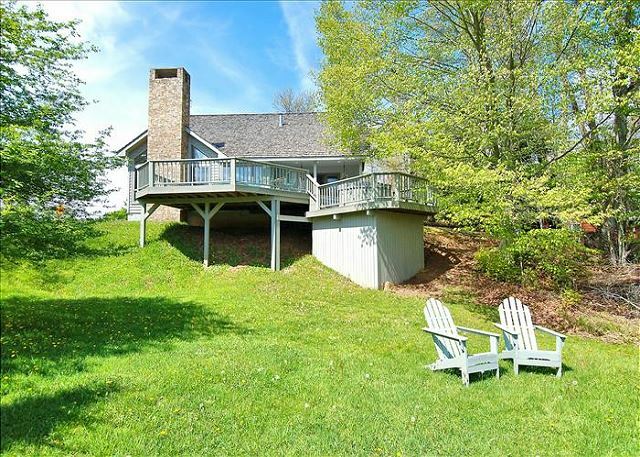 We rented this property for a hiking experience in the Monongahela National Forest. The location was good but plan to drive 20-30 minutes to get to the better trails. We had 2 families and there was plenty or room at this home. The house is showing a bit of wear, deck needs staining, chairs on the deck are ready for replacement, and we could never get the hot tub above 100 degrees ( we have one at our home and are adept at use). These were minor issues though as the property was comfortable, spacious and well designed. The property was spotless on arrival and all of our requests were quickly attended. The creek in the back of the property was picturesque and soothing. We were a party on 7 and the only complaint I heard from anyone was that the upstairs queen bed was ready for replacement due to a sagging mattress. The owner thoughtfully has left a good selection of beach towels and initial sundries for our visit. There is a Shop and Go in Davis with most needs, but we hit the Walmart in Morgantown prior to arrival. Wifi service was adequate but cell is spotty throughout the area. Don't miss Seneca Rocks, Elkins views or a trip on the trains. Lovely West Virginia area. We were pleasantly surprised with the local flavor, lack of crowds on the trails and friendliness of the community. Jeannie I from Haymarket, VA does not recommend this vacation rental. 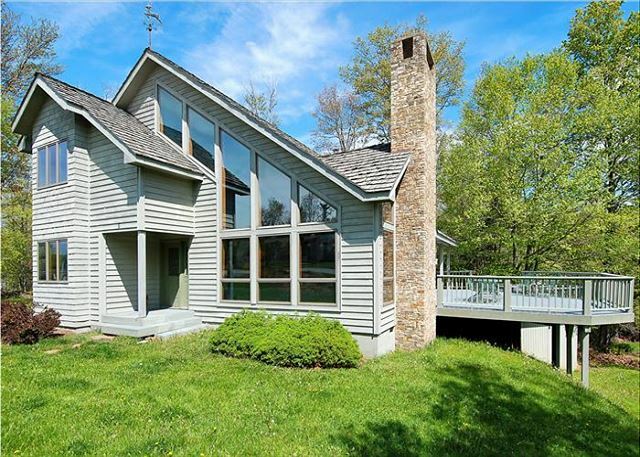 For our first time in Canaan Valley, this home was the ideal location. Private yard with a secluded hot tub, nice big deck to sit around. The home is very large, all bedrooms were large and had various beds and pull outs you could arrange. Seating in great room was excellent. The kitchen is large but the stove top and many of the cooking utensils were dirty, old or burnt. We started washing everything before using it. It needs a thorough cleaning. Third time staying here and it's always been great in the past. However this time there were some issues. Unit was not cleaned as needed to be along with other smaller problems. However the office was quick to take full blame as they've always been great to work with. We had two families stay with small kids. The house was clean and we enjoyed the hot tub and the small stream in the back. This house is lovely and perfect its in the mt.s has a hot tub and a realy pretty creek my family and I realy enjoyed our stay here and highly recommend this place to others. We loved this house and it suited our needs. Our only issues were several lights were burned out, dirty sheets in a linen closet, pull out sofa bed was dirty, no ball for foosball table, and mostly there were only 2 jets working in the hot tub and the light was out in it as well. Location was great and the property and house were beautiful! A month afterwards and I'm still thinking about how I want to build my dream home exactly like this one! We loved the house Higher Ground, and thought it was perfect for our family of 4. Great shape and all the equipment & utensils we needed. We had a wonderful week and plan to return. Loraine and Donna of Best of Canaan were very efficient and responsive, and helped make it a very smooth and easy experience. Thanks! We had a wonderful time in this lovely location. The house was attractive, comfortable and easily accommodated our group of 6 adults and 2 children. Our grandson had a ball playing in the stream behind the house. Although the property is on the main road, the beautiful landscaping made if feel secluded. There was ample parking but pulling out onto the main road was tricky due to a blind curve. This was our third time staying here and once again it was great. Office staff is great to work with, house is nice and comfortable and of course Canaan Valley is beautiful. We had a nice relaxing time! We had a nice time. We are a family of four and a dog!! Thank you to the owner and RE company. Great location - great home setup - places grows on you. Great location and layout. The only downside is there was pet hair everywhere and the vacuum did not work very well. Not ideal for babies crawling on the floor. Otherwise, it's a great home. We went to Higher Ground in the off season. The house has excellent bones and could accommodate a group of 12 easily. The house was in a bit of disrepair on the outside but they were in the process of sprucing it up. Inside was in very good shape with the exception of a number of very large stains on the upstairs carpet which were clearly from larger dogs who had stayed there previously. The entrance foyer is large and practical for dropping off all your gear with lots of hidden storage. Kitchen had everything we needed and we cooked in quite a bit. The babbling brook out back with the adirondack chairs was absolutely lovely - but if you have elderly guests they might not be able to get down there as it has a steep incline hill to get there. A nice house on a quiet street with excellent sweeping views from inside and out. We were satisfied with our rental experience. The house had more than everything we required. When we recognized that we had issues with the telephone and the hot tub, the realtor was quick to remedy them. The Canaan Valley is a great spot for hiking and this location was in the center of everything. Our dog enjoyed her vacation even more than we did. The grocery store in nearby Davis was excellent so we ended up eating (or preparing) all of our meals at the house. Definitely would stay here again - the Bride enjoyed the hot tub, the deck and the chairs by the stream. We have vacationed in Higher Ground on multiple occasions. The home is comfortable and in a great location. Some of the buttons on the hot tub did not work and the cable company has some picture quality problems. Other than that there were no problems. We would definitely rent Higher Ground again. My overall stay experience was great. The house was in a perfect location to escape the hustle and bustle of life in the NYC region. The house was clean and in good shape and the grounds was well taken care of. The mgmt staff was very helpful and their customer service was fantastic. I will definitely come back. Very nice home. Good layout. Very clean. When I booked I didn't pay attention that there was no AC. Was concerned at first but with the 2 fans that were in the home the house stayed comfortable. Would definitely rent this home again and recommend to friends. We did all the cooking in and the kitchen was very well stocked. Great experience with the folks working in the rental property office and the property was well maintained. Loved the setup of the house. We didn't realize that there wasn't AC until we arrived, but fortunately the temperatures weren't above 70's. House was very comfortable for the five of us. A little close to the main road into development but not to much traffic on road to bother us. 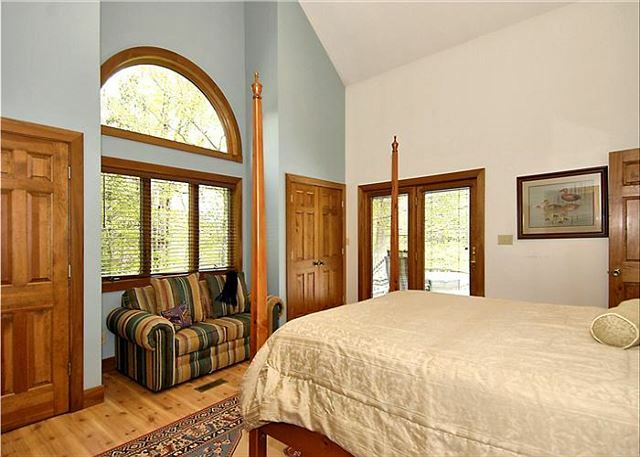 Great master bedroom and nice deck for sitting out on. Higher ground was centrally located to several attractions. The home was expertly equipped and well kept we thoroughly enjoyed our stay. Loved our time at Higher Ground in WV. My family and I celebrated my 50th birthday and my youngest son's graduation from high school. We enjoyed the beautiful property and even more beautiful scenery. Folks at Best of Canaan were very accommodating and friendly. Had a wonderful time, basically came to trout fish, the Blackwater was great on Friday 71 0's in the 50's, on Saturday it poured all day as we fished Glady Fork, woke up Sunday to over an inch of snow. If you know Canaan thst's the way it goes, just about right for the middle of May. Love that Canaan!!!!!!!!! This was the second year in a row we've stayed at Higher Ground. And even though the weather was terrible the accommodations as well as the company was excellent. The house was gorgeous and clean with everything we needed for a great trip. The kitchen was a chef's dream with a Viking stove and every utensil you could think of. The views were beautiful and the deck was the perfect place to enjoy it from. The neighborhood was quiet but still close enough to park and towns to make it convenient. A great spot! We were more than happy with the house. Great location and more than we expected for the great price. Would advise anyone to call Best of Canaan for there next vacation. Very close to Timberline and easy to find. The pictures tell a better story than I can. It fit 14 of us and there was plenty of space. House was very clean well maintained almost everything worked great appliances sweet layout perfect for a family of 10.Can not say enought about the staff at best of caanan best in the valley.Would rent this house again. The house was lovely and even more spacious than we expected from the photos. Everything was clean and in good working order, with a well-equipped kitchen. The master bedroom is downstairs behind the kitchen. There's also a den on that floor that easily converts to a bedroom with a foldout sofa, and there are two bedrooms upstairs, with a large main room (with a queen bed) and another room with bunks that are perfect for kids. Throughout the house there are spare sofa beds, and there are four full bathrooms (2 downstairs and 2 upstairs). The location was also good, amongst a small development of houses at the foot of the ski runs. It's an easy walk up to the ski resort. There are neighbors, but each house is well separated and quite private. And if there's snow and you have very small kids, there's even some small slopes slopes in the back yard that they can sled down. The entire deck area is both large and fully enclosed, which is also handy with small kids. Very Quiet & Spacious for Two of Us. Issue with Wireless connection & TV reception but resolved with employee. Hot tub bubbler features not functioning. Loved hiking in West Virginia. We have stayed in this house, Higher Ground, for the past 4 yrs. Our thanks goes out to the new owners for the many updates that been made to the house. They all made our great stay even better. It is one of our very favortie vacation spots and have high praise for the location, the house itself, the rental management team at The Best of Canaan (especially Donna! ), and the new owners! Our granddaughters, ages 15 and 12, love it there, as do the rest of the family. 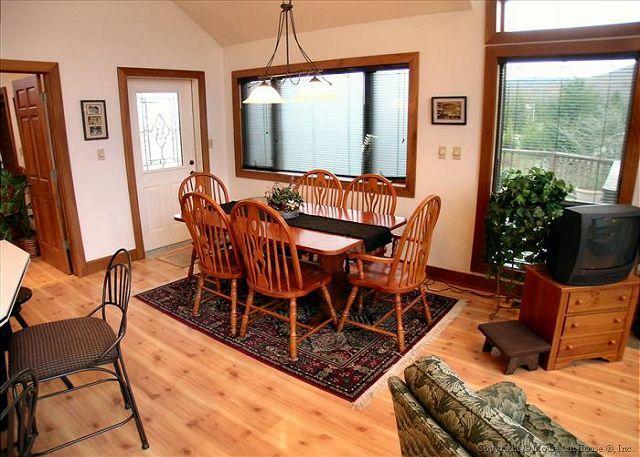 The home has nice open space to gather for meals. The location is well landscaped to provide privacy and its a great place for a quiet weekend. Nine of us stayed here for four nights in July. The weather was beautiful, the scenery spectacular! The area is surrounded by wildflowers, blue skies, lovely air and sunshine! The home is spacious, comfortable and well appointed. We all had plenty of room to spread out and relax. There is no air conditioning in the home, but none is needed. The largest bed is a full sized, no kings, no queens. There was plenty of linens and everything you need to cook is in the kitchen. We understand that this is a ski area, but found plenty to do in the summer months too. The closes grocery store is a an easy drive, about 20 minutes away in Davis. Nearby shops and galleries in Thomas, although small, had some lovely things to offer. The home is a perfect get-a-way for large families. Plenty of room to eat, gather, play, spread out and relax! There is a creek behind the house and it's a nice neighborhood to go walking in. The kids loved it and so did the grownups! The management company was exceedingly helpful and prompt in their responses to questions or inquiries about directions, or area information in general. This was our second time renting Higher Ground. The floor plan is great for large groups as bedrooms are far apart. Open floor plan and great room are nice for adults but this time with 3 grandkids it was very noisy. Also the house was not as clean as our previous stay and could use some general sprucing up but it has a great location, gorgeous views and we will probably continue to rent it it for our visits to Canaan. The house was absolutely beautiful and lived up to my expectations. I was not able to get any cell service while there but thank goodness we did have good wifi. This is a truly rural vacation home- there isn't much to do in and around the area if its raining. There isn't much to eat and most places are closed on Mondays and Tuesdays. Unfortunatly we were completely rained out from any activities such as hiking, biking, etc. Great place for a get away of old fraternity bros. Good location, near restaurants, fishing, golf, etc. Large deck combined with great weather made for much sittin' and bs'n while having a few cold ones. Wanting to come and do it all again next year! The house was extremely nice and comfortable. Especially enjoyed the fireplace. It gave the house such a warm and cozy feeling. Hope to stay there again, specially since we were able to bring our four legged member of the family. Exceptional home with all described amenities. 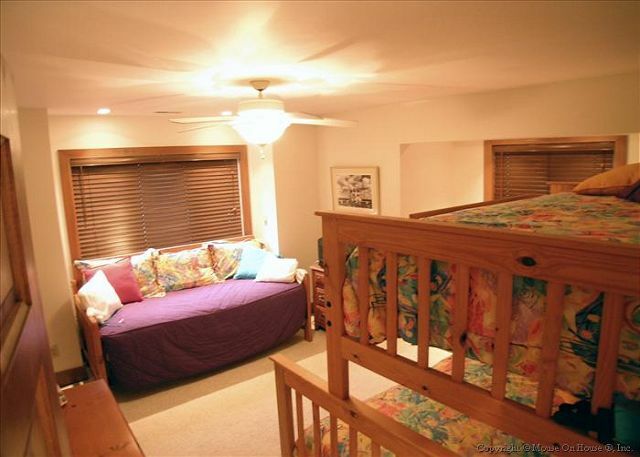 Home layout was great for multiple families and Bedrooms were roomy and well appointed. Location was ideal for Winter activities and access. Owner & Property management was pleasant and a pleasure to work with. Overall a great weekend Getaway! We had an incredible visit. 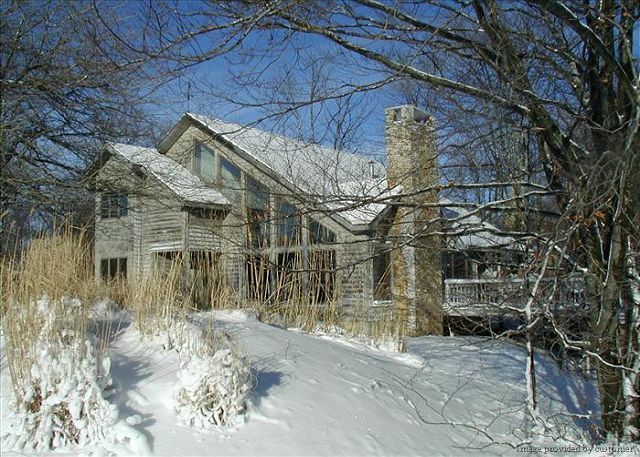 I had four small kids with me, who loved the house, the games, the sledding, the skiing and the hottub!. We wished it had been a longer visit, but we would love to come back. The only snag was that our dog decided to chase a skunk late one night and we had to try to wash her off on the porch in the middle of the snow storm. I was able to walk to the ski slopes everyday with the kids...its a perfect location. Can't say enough about this house! Have been vacationing in Canaan for over 30 years. This property was great...met all of our needs. Wonderful to have 4 bathrooms. Location was near the main road, but still very private. There was some confusion over which location was rented due to the original email sent out. Once that was cleared up, it was a great stay. The accomodations were just right for what we were looking for, and we had a great weekend. We had an amazing time at Higher Ground. The home is absolutly amazing. There was plenty of room for everyone and the location was perfect! The hot tub was great after a long day on the slopes. We had a wonderful time and its a beautiful home. Some appliances needed serviced such as gas range, refrigerator, and gas fireplace. Overall it was great. Beautiful house. Nice location. The house is beautiful and was clean. The location was perfect. The grandchildren loved to play in the creek. Having four bathrooms was a blessing. The layout of the house was great. We love the deck! The house was dog friendly! The kitchen was well equipped but there were problems with the appliances. The electronic ignition on the gas range clicked whenever the range was used; this was very irritating. The management company sent two people to look at it but a part was needed. Also the freezer did not work properly. It must be something in the defrost cycle. The ice cubes would freeze but could not be placed in the bin; they freeze into a solid slab. Ice cream became soupy. The hot tub temperature could not be adjusted except by the maintenance man. He was able to adjust it to a temperature that we liked. This was the perfect home for our families to have our laid back vacation. Even though the weather was cool, the house was big enough for us to hang out and have our own space. The hot tub was perfect since it was colder. However, instructions on how to get the perfect temperature in the hot tub would be great to have. We loved the laminated notes for the appliances, etc. The water heater may be turned up a little too high (sometimes the water at the kitchen sink was too hot). The house is right beside one of the main roads, so it was a little noisy at times, but not too bad. It is located within 30 minutes of Blackwater Falls (Davis, WV) and Seneca Caverns/Rocks. The Best of Canaan staff was very helpful and pleasant. Would highly recommend! Great place for a summer vacation with young children. Our children loved the yard, loved the creek, and LOVED the hot tub. Higher Ground was all that we expected and more. It was in great condition and very comfortable. We needed a big place to have about 40-50 people over for a college graduation party for our daughter. The deck on the back of the house was just what was needed. Also plenty of room inside for people to mix and mingle. 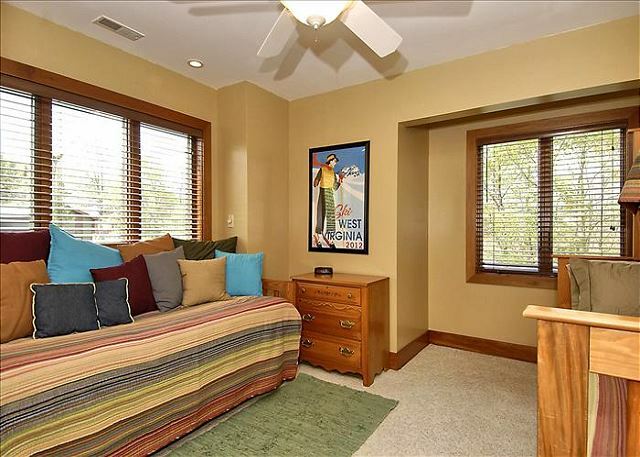 With the cool temperatures the easy opening of the windows and ceiling fans kept it cool inside the house. The hot tub was also nice after the long road trip from Texas or our excursions after getting to Almost Heaven. I also want to acknowledge and thank the staff at Best of Canaan, very professional and helpful. We spent a week here with family and had a great time. The house was well appointed and maintained and in a great location for access to a variety of activities. I would certainly stay here again and rent through Best of Canaan. The house is beautiful and location was great. We enjoyed our stay there and will tell everyone we see to stay here. Staff of Best of Canaan were fantastic. If you want to have a great time and a great house to stay in then look no further this is the one. Thank you. The house is great. Loved the huge patio with hot tub. It was nice that it was all fenced in so that we could let our dogs hang around outside with us without having to worry about them leaving the property. This house is probably better suited for families because while it sleeps many, most of the beds are in just two rooms. I stayed with 12 other adults, no kids, but we are all close and didn't mind sharing sleeping quarters. If you stay here in the summer, bring a big flash light if you plan on grilling outside at night. There are no outdoor lights for the patio. The mud room was great for storage and we kept all our excess baggage there. Very convenient. The kitchen was fully stocked, and we enjoyed the industrial grade stove/oven. The living room had a high ceiling so even with all 12 people in the living room it did not seem cramped at all. What a great time in a great part of the world. The perfect home in which to spend time with family who need time and space to catch up. Open and inviting layout, yet space for privacy if one needs a space to rest. We loved the beautiful fireplace, especially on the very special day that it snowed all day during Easter week. Lots of everyday "stuff" forgotten for a week while we enjoyed being an all-in-one-place family again. No complaints. Two suggestions.....handrails on the stairs to the second floor for the quite young and somewhat old and a step-stool in the kitchen for the vertically challenged who enjoy preparing meals. Pros: Beautiful rental house that is well-stocked with cooking implements, has comfy beds (a rarity in rentals), and a layout that provides a great gathering area. We also loved having the separate mud room for all our ski equipment. Cons: Only wish it had a gas grill, wasn't so close to a busy road, and had stairs that would provide access from the deck down to the beautiful yard below. That said, the pros greatly outweigh the cons, and we would rent there again in a heartbeat! Our family thoroughly enjoyed our long weekend at Higher Ground. The house was a wonderful surprise -- nicely decorated, clean, and in a great location to get to the slopes. The women at the management company were very friendly and helpful. We couldn't have asked for a better experience. We would definitely stay again. Loved our stay at Higher Ground, it is a beautiful home, nice furnishings, great layout, and great location. Loved that is was pet friendly, and our almost 10 yr old English bulldog loved that he didn't have to do many steps! Lots of room, plenty of bathrooms, and great kitchen. The only negative we could say, the kitchen wasn't as clean as it should have been, the counters and table were in need of a good cleaning, and we found several glasses/dishes that were dirty. And there were several light bulbs burned out around the house, a detail we always find annoying. Having said that, the hot tub was great, the view of Timberline was great, and we will be back. Not a lot to do if you don't ski, but our adult children and their spouses do ski, and we just planned to relax and do a little exploring, and that was perfect. Very few places to eat out at, but we did have drinks and appetizers at the Blackwater Brewing Company, it was a great place with friendly service and a warm fireplace. Thank you Higher Ground for a great getaway! 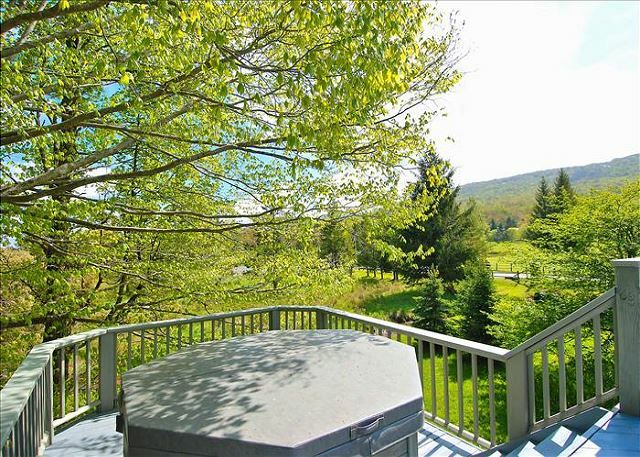 We have rented homes in Canaan Valley for the past 8 years - this is the most beautiful we have rented. Beautiful architecture and solidly built, sunny, magnificent fireplace, highend appliances and kitchen supplies, pristine sparkling clean hot tub, nice touches for kids ( their own den, airhockey and foozball). Bedrooms wih comfortable beds and linens. Many dog-friendly rentals are run down but this home is nicer than most that dont even allow dogs. 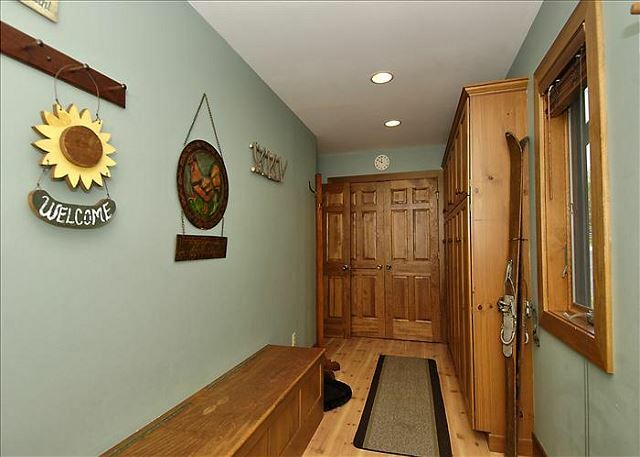 Location great - walkable or short drive to timberline ski area with no worries in bad weather (flat approach from driveway to main road). We will be back for sure. Great House small changes could make it Outstandig!!! Overall we enjoyed our stay. I would reccomend that laminated instructions for the fireplace and possibly the griddle and convention oven would be helpful. A gas grill would be a hudge improvement over the charcoal. The mattress on the pull out couch in the den should be updated in very poor condition. Overall the house is luxury but the tube TV's and the low quality sheets and towels just stand out as poor quality compared to all the other aspects of the house. We have stayed at Higher Ground for the past three years, and my family and I love it! The gals at Best of Canaan Realty couldn't be better! This house was very clean and comfortable. My family and I had a relaxing time and enjoyed the parks adjacent to the house. It was hard to leave. It was one of the best places we have stayed in Canaan Valley. The location is great. Nice for walking and biking. The kitchen is wonderfully equipped. There is plenty of games and movies. The furniture was comfortable.The staff of "Best of Canaan" were very nice to work with. We couldn't have found a more wonderful vacation rental. The rental agency was very friendly and professional. They were well informed about all aspects of the house. My only comment is to the owner and rental agency. At should a well equiped house, we were a little disappointed that there was not a gas grill outside. Charcol is messy and seems to me more dangerous then gas. Beautiful home, very clean, with everything we needed at hand. Would definitely recommend this property. This house was great for a big group with all the separated sleeping areas, each with own BR. We would rent the same house again in a heartbeat. 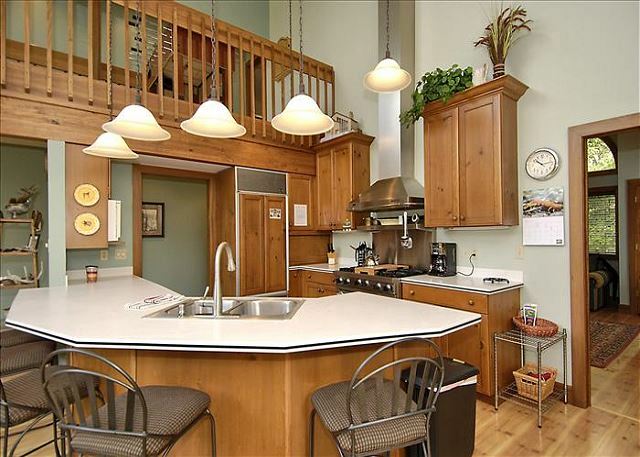 Very homey and not at all stuff, but with luxurious touches - steam shower, fireplace, pro kitchen, hot tub, etc. Nicely decorated with comfortable furnitures, just as shown in pictures. I just wish the master had a king bed. Open floor plan was perfect for all of us hanging out together. LOVED this house. Awesome house with everything you need for a relaxing stay; terrific staff at Best of Canaan exhibiting professionalism and courtesy whenever called upon and the breathtaking natural beauty of the Canaan Valley region made for a wonderful vacation for our family. We would highly recommend this property and Best of Canaan to anyone. Thanks for everything! This was our second year coming to Higher Ground. Our family truly loves this area and highly recommends this house. Thanks to the owners for making this available to us!! Beautiful home. We had a great time watching the deer and hummingbirds. Great place to just kick back and relax. Great place. Close to the ski slopes. Nice View of the slopes. We enjoyed our stay. The property was clean and properly maintained. Great location. The only things that might need to be changed are the coffee maker (not a big deal) but it makes the mornings nicer :) and the kitchen glasses. They all have hard water deposits. Also I would have loved to have a wood-burning fireplace. The house was build with one but it was converted to a gas fireplace. For day by day use in a residential house it might be convenient to have a gas fireplace but in a vacation home in the mountains I love a wood-burning fireplace... but again this is my taste. Some people might actually enjoy the gas fireplace..and is a very nice one. No gas odor or things like that. It's properly ventilated. 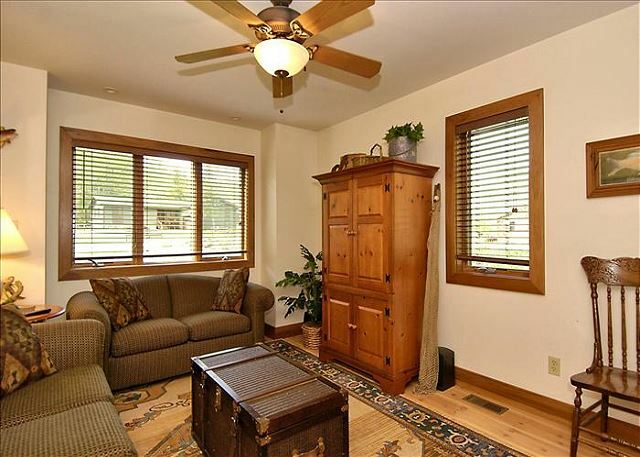 Beside these things the property is great, close to the slopes, clean and properly maintained. I would highly recommended it. The property management company is as professional and friendly as it can get. Thanks. I'm looking forward to book with them again. A+++++ .. and I forgot... the property has nice view of the slopes in Timberline... especially at night. This should be advertised with the property. A+ for the staff at Best of Canaan! This was our second year staying at Higher Ground, and we have already booked our reservations for next year. I think that says it all! House is beautiful and very clean. Ladies working in the office were very friendly. Hot tub may not be working right as it took 5 days to heat up. We didn't realize there would be so much traffic into/out of the gated community next door. Loved the house itself and the area. very pleased with overall experience. had a super vacation. from our 5 year old "I want to buy this house!" This was our 1st trip to the Valley, but not our last! We really didn't know where the house was located but couldn't have been more please. We have 8 children and there was plenty of room to run and have fun. They loved playing in the creek and relaxing in the hot tub. Actually, we all loved the hot tub. When my husband told our 5 year old he wanted to have the hot tub for Christmas, our son said he wanted the HOME for Christmas! The home is beautifully decorated and very clean. Also, it made everything a lot easier to be able to take our dog. Our kids have said this is where we have to come back every year...and we agree! Great location, grandkids loved creek, house was spacious and everything we wanted in a vacation rental. Only minor disappointment was hot tub didn't get very hot. Overall, was great and we will rent this place again. A wonderful, comfortable home with a large, well-appointed kitchen. The little stream running through the back yard was a big hit with my son. 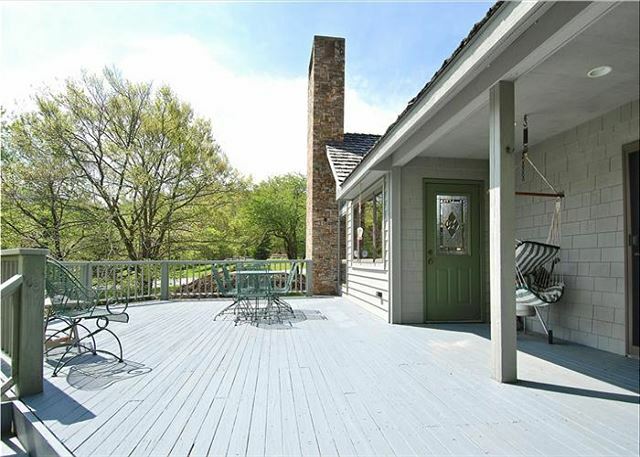 Well located and close to tons of outdoor recreation, but just as well suited for watching the sun set while dining on the deck. Only drawbacks: right next to main road leading in to Old Timberline; bathtubs fill very slowly. Still can't go wrong choosing Higher Ground. Amazing stay at Higher Ground, didn't want to leave! I was relocating to Canaan Valley and needed a place for myself and animals to stay while I found long term housing. Higher Ground was a terrific temporary home and exceeded my expectations for a vacation rental. The setting is beautiful, loved being along the stream and the view of the mountain off the deck was wonderful. The layout was great for entertaining and spending time with friends. It allows everyone to be part of the action whether cooking or simply relaxing. The nicest aspect of this house is that it didn't feel like a rental property. The construction, amenities, furnishings and finishes are quality and mirror those you'd choose for your home. I had a great two months at Higher Ground and wish I could have moved in for good. I’d like to compliment Best of Canaan for their great customer service and depth of knowledge. Even though our stay was short the home was amazing. It's had everything we needed. The fully equipped kitchen was great. Only problem was the wifi but not such a big deal. I would recommend this home to any family or group of friends. I'm looking forward to coming back next year and hopefully staying longer. Thanks for everything. We had a wonderful time at Higher Ground. It is a very nice house, well kept with all you need for a relaxing stay. Close to the slopes but probably not walking distance with ski boots on but close enough for easy drop off. we'd stay there again. Overall we had a great time. The property was wonderful and the attention that we received from the staff made all the difference in creating a great holiday experience. Thanks to the staff (Donna) at "Best of..."
We had a wonderful time at Higher Ground and have already reserved a week for 2012. The girls at Best of Canaan were great to help in anyway they could to accomodate us. We were all very pleased with everything! Great rental property. Was in nice condition and had all the amentities you would want. Center griddle on the gas stove was a highlight and made for good eats. It was a little close to the main road back into Timberline, as it sits on a corner lot. But, it was walking distance to both the chairlift and Trail Mix (store). Overall, just a great vacation! Lovely house and location. Late Sept was a great time to see the leaves change! Had a great time, lots to see and do. Kitchen appliances where top grade except for low end microwave. Phones were very poor quality and the TVs could be upgraded. Overall we were very satisfied and had a great time. didn't notice that the house doesn't have A/C till we stayed this would have been nice to have on the warmest days we were there. LOVE the staff at Best of Canaan, and truly they are the best. We would rent from Best of Canaan again in a minute. We have stayed twice at this house for a total of 32 days. It is generally a nice house, but could use some updating of kitchen equipment and TV in living room. The sound is dying on that TV and was hard to tolerate. Deck also needs splinter maintenance. Hate the bed in the MBR. It is too high and a broken hip waiting to happen. I am almost 50 and only 5 feet tall. It was not at all fun to try and climb in and out of the bed which was 36" high. Wouldn't rent again because of the bed. For this second stay, the house no longer had free long distance. Okay for a weekend, but for 2 weeks we needed access to a phone, and we had no cell phone coverage from our carrier. Donna was great in helping provide emergency contact to a local vet, but things could have been easier with a phone. Suggest adding it back, offering a small fee to use or at least letting renters know to purchase a long distance card before arriving in the valley. Thanks for taking the time to comment on your recent stay at Higher Ground. We sincerely hope that overall, during you time here, your experience was more pleasant than unpleasant. All of us at Best of Canaan, along with the owners of Higher Ground, regret that you were not pleased with the house in general and are currently evaluating all of your issues. We certainly appreciate your input and want to remind all of our renters that we are available 7 days a week to answer questions and resolve maintenance issues. We absolutely loved staying at Higher Ground! The only recommendation I have is a gas grill instead of charcoal. I had quite the time getting it going since I am not used to a charcoal grill. Other than that, it was perfect and we will be back.